~Jo's Scrap Shack~: Cricut Card Challenge #116 "Creature Feature"
Cricut Card Challenge #116 "Creature Feature"
I found this adorable card on page 68 and cut it out at 4". I cut out the R.I.P. tombstone at 2.5" and the bat at 1 3/4". 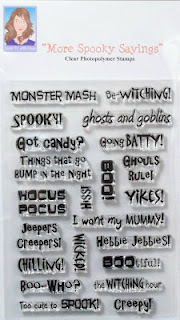 I used Mary's Cardz TV stamp set "More Spooky Sayings" and stamped "Spooky", "Boo", "Creepy" and "Yikes" for some fun. I hand drew the "web line" for the spider and the spider stamp is an old stamp that I got at Michael's. I used my white gel pen to outline the pumpkin and for the pumpkin's eyes and the bat's eyes. All my papers are from Bazzill. I am going to stamp "Happy Halloween" in orange zest ink (Paper Trey Ink) behind the pumpkin and give this cute card to my 5 year old niece for Halloween along with some Halloween goodies. I hope you come join us for this challenge and if you do, there is the chance that you could win a great prize!!! Thanks for stopping by!!!! Enjoy your weekend! Great job on the challenge! Thanks for playing along with us at CCC! Your niece is going to love this card. This has always been one of my favorite cuts from WC. In fact it was the first card I made off the cartridge when I got it many years ago. I love how you used the stamps all over in the background. Great idea! 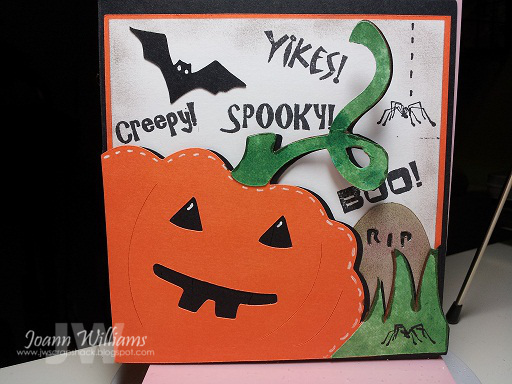 Thanks for playing along with our Cricut Cardz Challenge on Cardz TV. Adorable card...perfect for your niece or anyone! It is so funny....because I have never used the card cuts on this cartridge! Need to dig that one out and play! Great job on the challenge. I just love this cut. Thanks for playing along with us at Cricut Cardz Challenge.